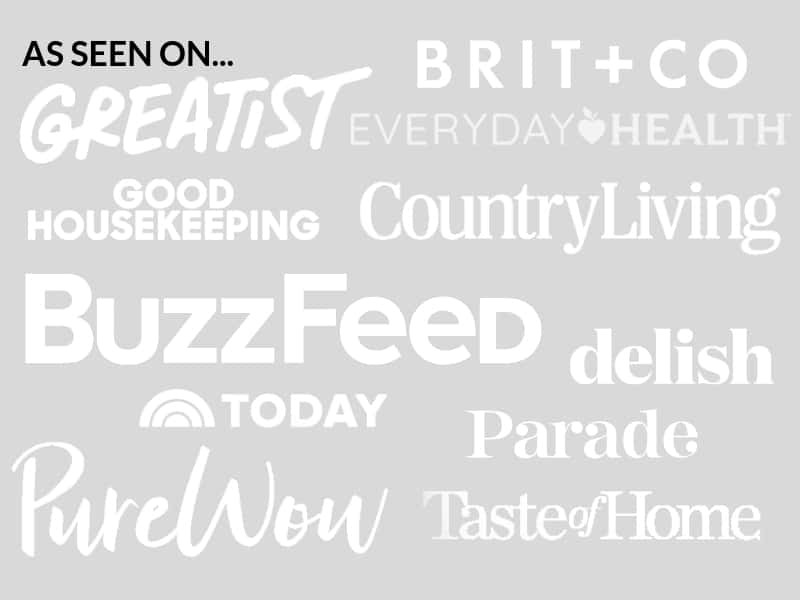 April 22, 2017 By Elizabeth Lindemann 7 Comments / This post may contain affiliate links. These Shrimp and Zucchini Fritters are a GREAT way to eat your veggies, and are a budget-friendly choice since a little shrimp goes a long way. The lemon-garlic yogurt sauce they are paired with is creamy and addictive. And the zucchini and shrimp are a match made in heaven- their flavors stand out so well in the simplicity of this recipe. Also, HAPPY EARTH DAY! Not only is this a budget-friendly recipe, but it’s also earth-friendly. One of my favorite things to do for the environment is to eat less meat. I’m not a vegetarian, but skipping meat or limiting it can really have an impact. These are meat free, and they stretch out just a half a pound of shrimp (wild caught) for four servings. I’ve made fritters in the past… scratch that. ATTEMPTED to make fritters in the past. I’ve had them fall apart into a mushy mess, or added WAY too much oil to the pan when they seemed to not want to stay together. I was never very successful, but I wanted to be. 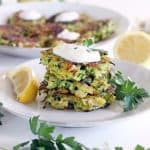 Every time I came across a photograph of zucchini fritters on Pinterest I was practically trying to eat them off the computer screen. This time, I got it right! Here are a few tricks to making fritters that won’t fall apart and that don’t use too much oil. Make sure as MUCH liquid as possible is squeezed out of the zucchini. After you grate it, place it in a clean kitchen towel. Roll the towel out and wring it out like you would a washcloth in the shower. Do NOT use a paper towel for this- it’s just not sturdy enough (plus, you’ll help save the environment!). For extra credit, you can also pat the shrimp dry before adding to the bowl. Use TWO eggs. The eggs will cook while the fritters are frying, binding the batter together and ensuring it doesn’t fall apart. If it’s too liquidy, add more breadcrumbs. Scoop the batter into 2 tablespoons hot oil with a large kitchen or ice cream scoop (or a 1/2 cup measure if you don’t have one) loosely, rather than forming patties beforehand. Press down gently with the back of a spatula and let the bottom cook and brown for 3 minutes without touching them. Then, flip and cook for another 3 minutes. Allow to cool on a paper towel lined plate. This will remove some of the oil and also allow them to settle and firm up a bit, so you can pick them up without them crumbling apart. Time-Saving Tricks: You can make the mixture for these fritters ahead of time and keep in the refrigerator for a day or two. I recommend waiting to add the salt until just before cooking, since salt will draw out even more liquid from the zucchini. Serving Suggestions: These are SO versatile. They are great on their own topped with the sauce with a side salad, or stuffed in whole wheat pita pocket sandwiches smothered in the sauce. Or, serve them for brunch topped with a poached egg. Make them smaller for a fun appetizer, or make them bigger to serve on burger buns. Make a big batch and eat the leftovers all week long for lunch! 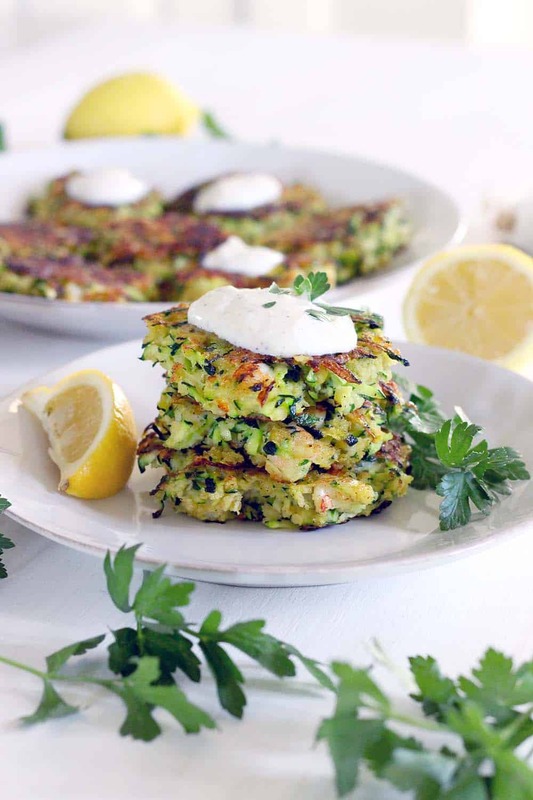 Thanks Cooking Light for the inspiration- check out their Zucchini and Shrimp Cakes from their latest issue here. 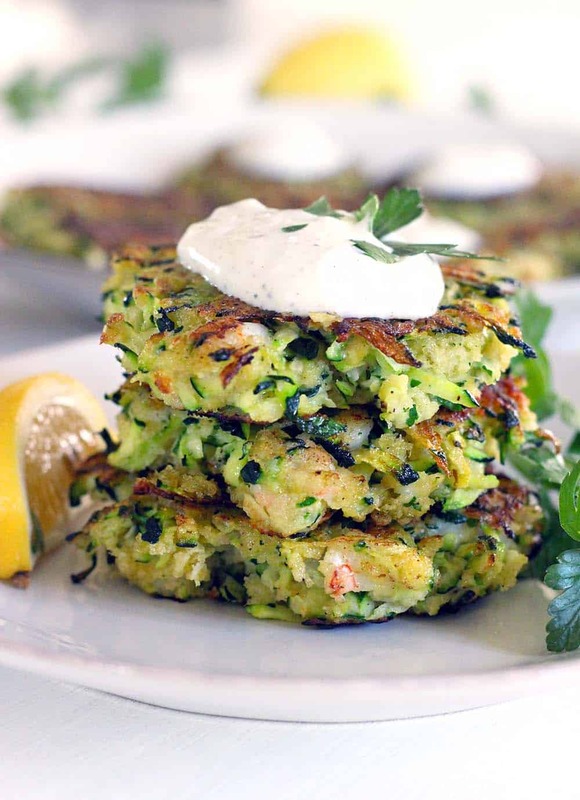 Recipe for Shrimp and Zucchini Fritters with Yogurt Sauce below! This healthy Shrimp and Zucchini Fritters with Yogurt Sauce recipe is a delicious way to eat your veggies! The yogurt sauce is garlicky with lemon, and the zucchini and shrimp stand out in the simple fritters and are a match made in heaven. Mix together all ingredients for yogurt sauce. Set aside. Using a clean kitchen towel, squeeze out as much liquid from the grated zucchini as possible (do not use a paper towel for this as it will likely fall apart). 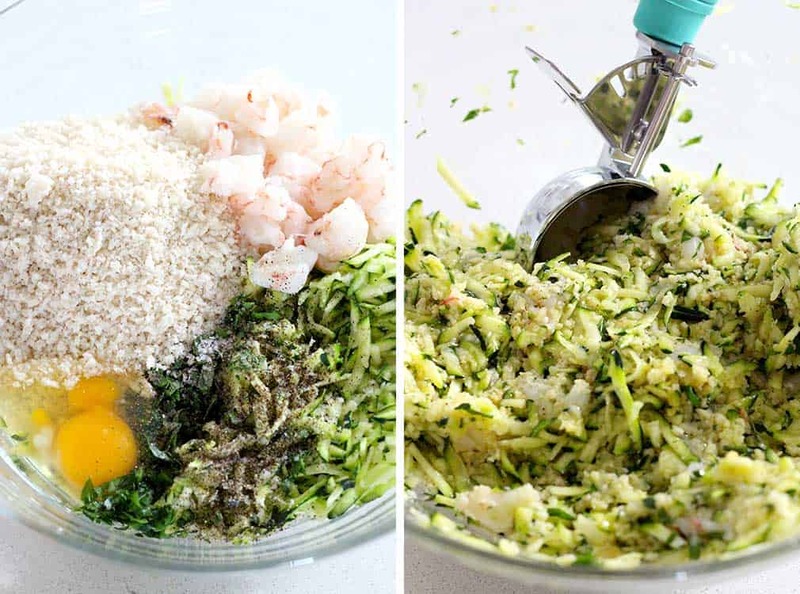 Combine zucchini, shrimp, eggs, breadcrumbs, salt, pepper, lemon zest, and parsley in a large bowl. Mixture should hold together well- if it seems too wet, add some more breadcrumbs. Heat the oil in a cast iron or other heavy skillet over medium-high heat. Using a large scoop or a 1/2 cup measure, scoop mixture into hot oil. Flatten tops slightly with a spatula. Cook for 3 minutes, flip, and cook for another 3 minutes, or until golden brown on both sides. Remove and place on a paper towel lined plate. Continue until all of zucchini mixture is used up, adding more oil if necessary. Serve fritters with yogurt sauce and lemon wedges, if desired. Great on their own or in a pita pocket sandwich. For a dairy-free recipe, use mayonnaise instead of yogurt in the sauce. Hi. Would love to try this but shellfish allergies necessitates I substitute something else. Would tuna or salmon work as well? And what temperature would you recommend for baking these fritters and for how long? Not fond of frying foods, if I can avoid it. Thanks. I think canned tuna or salmon would be great! You can probably use fresh raw fish as well, cut into small cubes. For baking, I recommend forming the patties and brushing with olive oil (or using cooking spray) and placing them on parchment paper to prevent sticking. The oil will help get them to have a crispier crust, even though you aren’t pan frying them (but you can also probably leave it out if you don’t want any oil at all!). Try 400 degrees for about 10 minutes, then flip and cook for another 10 minutes. Hope that helps, and hope you like them! Thanks for all the information. Gonna give it a try. I like the idea of either fresh tuna or salmon. Sounds so good. Have you tried freezing these after cooking them in the skillet? :) Looks like a ton of work but recipe seems super straightforward – amazing! I haven’t tried it, but I’m 98% sure it would work fine! I’d separate each patty with a small piece of parchment paper when you store them, or flash freeze them before adding them all together, so they don’t freeze into one giant piece. Don’t worry- the only kind of difficult part of this recipe is the frying- you just have to be careful because they are delicate. Hope you like them! Oh my, that’s amazing. Happy earth day!